We have 0.5 Ohms as well 1.2 Ohms Coills. Please specify Ohms during checkout as a comment otherwise we will send 1.2 Ohms. Buy only genuine coils - Beware of fake coils sold at half the price it can only indicate inferior copy product. 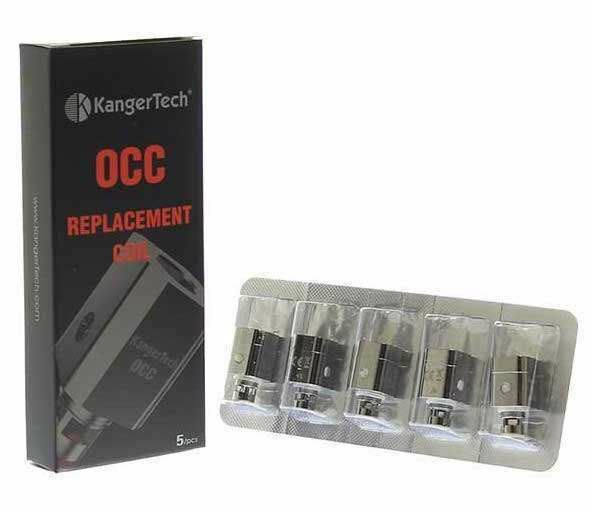 The Kanger OCC (Organic Cotton Coil) Coils are the replacement coils for the Kanger Subtank family of tanks. These are the genuine Kanger OCC Coils for the Kanger Subtank Mini. These Kanger OCC Coils are absolutely wonderful - the cotton wick provides the purest flavor and the coil head design is very efficient. These Kanger OCC Coils are vastly improved from kanger's previous coils and produce an amazing vape even for thicker eLiquid. The Kanger Subtank OCC Replacement Coils are the brand new Organic Cotton Coils (OCC) specifically designed for the Kanger Subtank. These OCC coils have a square outer stainless steel casing, a larger heating section and come built with organic cotton wicking which enables you to produce a huge vapor as well as a pure taste. The Kanger Subtank OCC Replacement Coils come in two resistance options 0.5Ω and 1.2Ω and are the most innovative coils available on the market right now.